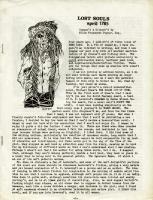 Lost Souls - ZineWiki - the history and culture of zines, independent media and the small press. Lost Souls is a zine by Wilum Pugmire. Lost Souls was released in the 1980s. The cover date is given as 1785 for the issue shown. Wilum Pugmire also published the fanzines Midnight Fantasies and Old Bones in the 1970s and Punk Lust in the 1980s. In the 2000s, he released the titles Idiot Chaos and Lovecraftian Euphoria for the Esoteric Order of Dagon. This page was last modified on 25 September 2015, at 05:24.